I go way back with John and Lynne Ford who were restaurant patrons when we had our restaurant business. John is a camera fundi, did a four year diploma in photography in London, and a food and wine lover of note. Ditto Lynne, but not the camera part. John left Corporate Camera and they opened a delightful shop in Main Road Sea Point called Main Ingredient. Eventually the shop closed and they concentrated on the various markets around town. Then the profile of the person attending markets changed, they no longer went to shop, they went to eat. So john and Lynne went online and opened a web shop. They sell salts, spices, preserves, vinegars, sauces, chocolate, luxury goods such as patés, duck fat, truffles: fresh to order, in jars, in oil; tins of duck confit, the best vanilla products and other real flavour extracts (they won’t sell fake essences or food colourings). In addition to some excellent South African products like Protea Hill Farm’s wonderful herb and fruit vinegars, they sell delicacies from Spain, Italy, France, England, the Mediterranean, Middle and Far East, even the Americas. They also have a huge network of food sources so they are able to advise you where to find things that they don’t sell. And Lynne, no mean cook herself, is happy to give advice on how to use and cook ingredients. Their customers are food and wine lovers from all over South Africa and they post small items to destinations all over Southern Africa and other countries as well. John and Lynne have many loyal foreign customers, some of whom are ‘swallows’ who live here for a few months each year and they bring not only new ideas but also their custom. They don’t sell the same things as the supermarkets, but they do sell what they don’t, won’t or can’t sell. Not able to compete with their prices, try to be different and innovative. Great ‘eaters-out’ they watch cooking and eating trends and try to anticipate them by finding the ingredients first – or getting someone local and talented to produce them. Well worth a visit is their website – click here. 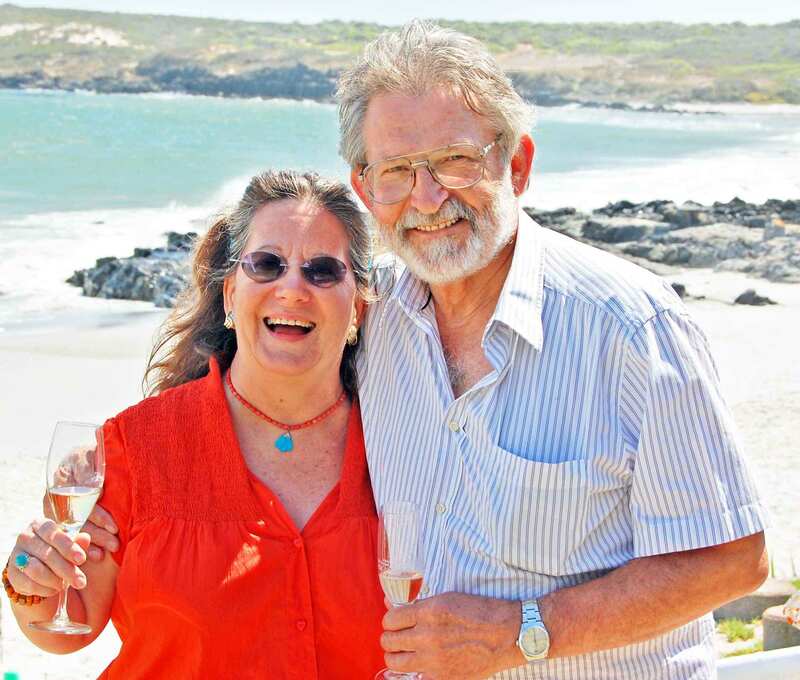 John is a wine fundi of note, and knows the Cape like the back of his hand, most of the vineyards and winemakers too. His Adamastor and Bacchus Wine Tours are bespoke and you could not be in the hands of a better person. Click here for more information. After we retired from our corporate jobs in 2002, we started to look for the exotic food items we saw on the TV chefs’ programmes. We were able to find many of these ingredients in diverse locations all over the Western Cape, but there was no single outlet at which they could conveniently find all the products they wanted. So, realising that there must be other foodies looking for the same types of products, we decided to open a gourmet shop to cater for enthusiastic and adventurous cooks who wanted more than the standard supermarket offerings. Lynne is an experienced and enthusiastic cook and spent nearly 30 years in England, working in the publishing industry, before she returned to Cape Town after the 1994 elections. She worked at Safmarine in the Public Relations department and then at the UCT Graduate School of Business as an administrator on the Executive MBA programme. John, after spending a couple of years reading English, History and Political Science at The University of the Witwatersrand, decided to train as a photographer and embarked on the four year diploma course at the Polytechnic in Regent St, London. During the course of this he worked for a year in Oslo, Norway, where he learned to speak Norwegian. After his return to South Africa in 1971, he worked as an advertising photographer until 1978, when he joined AGFA as a sales representative. He was promoted to Regional Sales Manager in Johannesburg and then transferred to Cape Town at the end of 1986, where he worked until his retirement in 2002 as Regional Manager, Consumer products. We met studying at the Cape Wine Academy where we both graduated with the Diploma in Wine in 1996. John has a Satour licence to operate as a wine industry specialist tour guide. Our mutual interest in good wine and food led to the start of Main Ingredient at the end of 2002. We were married in 2003.